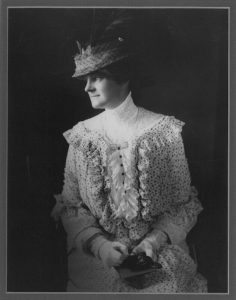 Anita McCormick Blaine was born on July 4, 1866. Before she was eighteen she inherited great wealth from her father, Cyrus H. McCormick, contributing inventor of the mechanical reaper and later founder of McCormick Harvesting Machine Company. Growing up with inherited wealth and privilege, she imposed great responsibility on herself to use her great fortune to benefit those caught in the web of poverty, miseducation and violence. Under Anita’s pioneer philanthropy, the stage was set for the New World Foundation to become one of the few foundations then willing to support beleaguered Southern efforts to further civil rights and desegregation. Anita also began funding John Dewey’s experimental school practices that gave center stage to the development of children rather than the well-being of the educational establishment. As a result, she founded the Francis W. Parker School in Chicago, and the School of Education at the University of Chicago. Due to Anita’s interests in worker safety and relations between employers and employees, she was an ardent supporter of union organizing and insisted that workers in her Chicago mansion had to be union members. Some people who knew her thought that this was extreme, but Anita was committed to both individual and social conditions. At the beginning of the Cold War, Anita opposed aggressive U.S. foreign policy and became a major donor to independent politics and the peace movement in funding the World Federalist Movement and the League of Nations, the forerunner of the United Nations. Following Anita’s death, her granddaughter, Anne Blaine Harrison, continued Anita’s work. As a result, over several decades, the New World Foundation built a reputation of innovation and effectiveness, which was so well recognized as a serious force that the Foundation became known for always punching way above its weight. When Anita chartered the New World Foundation in 1954, she was starkly aware of the enormous societal injustices of the time—racial segregation,voter disenfranchisement, unsafe working conditions resulting from the industrial revolution, disease, educational disparity, the languishment of dissenters under the oppressive shadows of McCarthyism, and the overall inequitable experience of those Americans who were most flagrantly and persistently denied full participation in society. Almost sixty years after New World’s founding, Anita’s commitments—to education, democratic participation, economic equality, children, civil rights, workers, peace and the health and equal opportunity for the entire global community—continue to shape our central mission and match that purpose to both time and place.